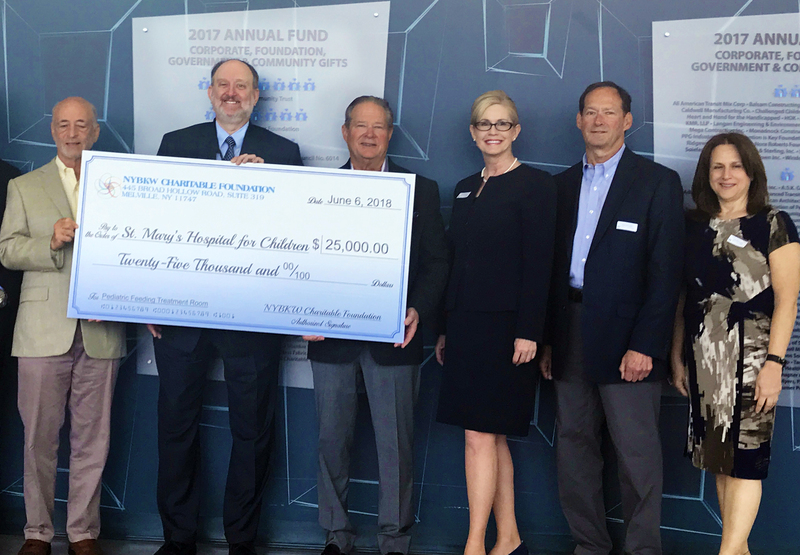 Continuing the NYBKW Foundation’s longstanding mission to support hospitalized children and their families and caregivers, the Board of Directors presented a $25,000 check to St. Mary’s Hospital for Children. Simultaneously, the Foundation has announced it is now accepting sponsors for its signature fundraising event, the 2018 Tastes for Tots strolling dinner. “This donation to St. Mary’s Hospital for Children is just one of the Foundation’s many initiatives to support chronically ill children and their families,” says Foundation Chair Barry Berg. “But the community needs us to do even more. 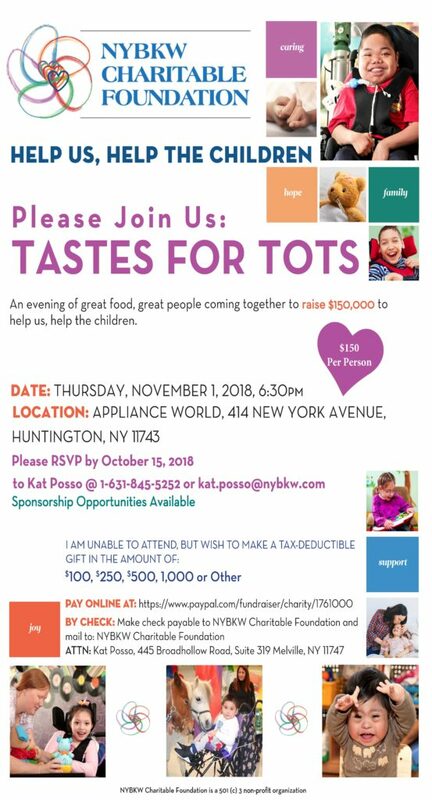 “That is why we continue to reach out to our friends, families, and longtime supporters to invite them to help us help the children by becoming a Tastes for Tots sponsor. Together we can reach our goal to raise $150,000. The NYBKW Charitable Foundation is pleased to announce a recent gift to Cohen Children’s Medical Center. In support of their Child Life Program’s effort to make hospitalization easier for children with special needs and intellectual abilities, we have awarded them a $30,000 grant to create an NYBKW Charitable Foundation Snoezelen ® Room for children with anxiety and fears. A Snoezelen® room is a multisensory environment, which is designed specifically for the population served. It is equipped with varius sensory experiences that have been shown to decrease fear and anxiety and increase coping abilities in children. The NYBKW Snoezelen® room will enable the staff to help pediatric surgical patients to remain calm prior to their surgery and heal after their surgery in a non-threatening, soothing environment. Some of the senses that will be supported by this room include: the sense of smell, touch, sight, and hearing. The room is designed to give the children access to familiar activities, while being in control of their experience. Pediatric patients will be able to choose from various calming scents with the aromatherapy component, various soothing images to be displayed on their ceiling or wall, various soothing sounds to listen to, and various tactile activities to occupy their physical needs. Please check back for an update to see how the current room was transformed in the NYBKW Snoezelen Room.